Artists, musicians, actors, singers, designers and other creative individuals need to understand basic business concepts if they are to successfully pursue their chosen artistic profession. These skills have historically not been taught to creative students, which leaves them unprepared to make a living from their artistic efforts. Entrepreneurship for the Creative and Cultural Industries will teach the basics of business in a way that is relevant to the challenges of running a small business marketing a creative product. Whether it is understanding the basics of business language, appreciating the crucial importance of finance, or using social media marketing, this innovative textbook covers the entrepreneurial skills required to succeed in the creative sector. Including advice from artists who have turned their idea in to a profitable business and worksheets that can be combined into a simple business plan, Kolb helps non-business minded creatives to understand everything they need to succeed in the increasingly competitive creative economy. 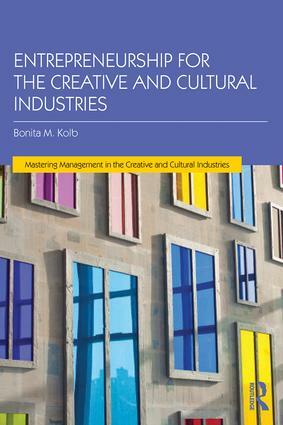 Dr. Bonita Kolb has been researching the creative and cultural industries for the last fifteen years. While currently an Associate Professor at Lycoming College in the USA, she has also taught business classes to graduate students in cultural management, art and music programs at Pratt Institute in NYC, Sibelius Academy in Helsinki, and the Estonian Academy of Theater and Music in Tallinn.